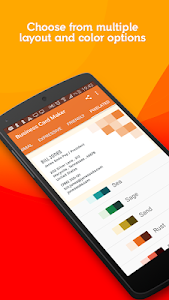 What is Business Card Maker & Creator? • It’s a free, online business card designer from Shopify, and made for aspiring entrepreneurs, company owners, and corporate individuals. 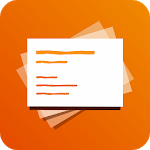 • Our business card making software is a top rated design studio for creating visiting & business cards on Android. • A freelance graphic designer is not needed as the application is fast and easy to use. • Make custom, business, visiting, or name cards that suit your style. • Create a business card for realtors/real estate, writers, photographers, lawyers, job seekers, teachers, musicians, actors, students, and any other profession! • Save your time and money by not hiring a costly graphic designer. • Add your own element of individuality to set your brand apart and put your best foot forward. • Edit any information you want on the visiting card like your name, logo, picture or photo, and website name using the business cards editor. 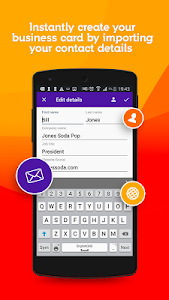 • Optionally, sync your contact details to build and fill your digital business cards design. • Swipe between countless types of free and cheap business card templates to suit your tastes. • Save, share, or export your custom and personalized card as a PDF and print at nearby print shops like Staples or use online services such as Moo and Vistaprint. The app's clean interface makes it easy to use, and the app will never confuse you with complicated customization options. The pre-made designs are timeless and professional, so even if you don't have an eye for art, you can make stunning and unique business cards that are standard wallet card size and fit in any biz card holder. On top of that, the process for making your electronic card is simple and straightforward to use. Gain inspiration & ideas by swiping left or right between sample background cards. Just like your business website the sharing of your business cards provide a quick and easy snapshot of your brand for your business acquaintances and network. 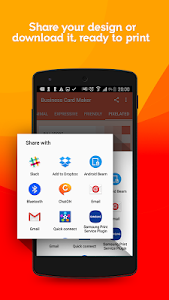 So download our free, Business Card Maker & Creator app, and upgrade your brand instantly! - Yet more sneaky bugs squashed! More improvements coming your way always and often. Stay tuned ? Similar to "Business Cards Maker & Creator"